Start here using the materials and additional stitch descriptions listed with the afghan you have chosen. Round 5: Sl st into next st, ch 2, (*work increase shell in ch 2 space, dc in next dc, skip next 2 dc, dc in next st.) Repeat from * around, sk two sts, join to top of ch 2. Each point should now have 1 dc, an increase shell, 1 dc for a total of 6 dc. Round 7: Sl st into next st, Ch 2, dc in next st, * work increase shell in next ch 2 space, dc in next 2 sts, skip 2 sts, dc in next 2 sts. Repeat from * around, ending with skip 2 sts. Join. Each point now has 2dc, an increase shell, 2 dc for a total of 8 stitches. 4 dc on each side of ch 2 point. Round 8: St into next st, ch 2, dc in next 2 sts, * work increase shell in ch 2 space, dc in next 3 sts, skip next 2 sts, dc in the next 3 sts. Repeat from * around, ending with skip 2 sts. Join. Each point now has 3dc, an increase shell, 3 dc for a total of 10 stitches or 5 dc on each side of ch 2 point or total 120 sts. Round 9: Sl st into next st, ch 2, dc in next 3 sts, * work even shell in ch 2 space, dc in next 4 sts, skip next 2 sts, dc in next 4 sts. Repeat from * around, ending with skip 2 sts. Join. Round 10: Sl st into next st, ch 2, dc in next 3 sts, * work increase shell in ch 2 space, dc in next 4 sts, skip next 2 sts, dc in next 4 sts. Repeat from * around, ending with skip 2 sts. Join. Round 11: Sl st into next st, ch 2, dc in next 4 sts, * work increase shell in ch 2 space, dc in next 5 sts, skip next 2 sts, dc in next 5 sts. Repeat from * around, ending with skip 2 sts. Join. Continue working in rounds in pattern as established, always working 1 round with even shells followed by 2 rounds with increase shells. As you continue repeating rounds the number of dc will increase 24 stitches (2 stitches each point) on every increase round until the desired size of afghan is accomplished. When you design your own Stash-buster, the yarn weight, your tension and hook size determine the stitch gauge and the number of rounds needed to accomplish an afghan in the size you desire. The color selections and stitch patterns selected to use in each round are your choice to help you create a personally designed afghan. If buying new yarn: four 7oz skeins of Red Heart Super Saver makes a lovely personal size afghan. 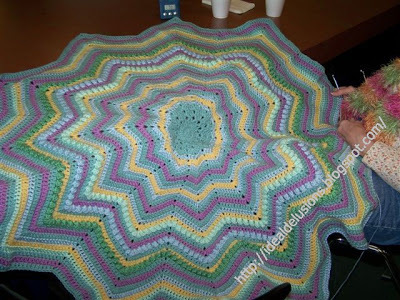 To create a Stash Buster Afghan such as in the photos on this page: gather about 30 to 35 ounces of worsted weigh yarn which is more than you need but since the endurance of the individual yarn balls are unreliable some may have to be abandoned as too small. Weigh each yarn ball and number it as you will be starting with the smallest and progressing to larger yarn balls as each prior color runs out.. The largest amount will be your base color and you may even wish to use a full skein as a base color. The smallest amount will be used to start the center using progressively larger balls as the afghan expands. As your work progresses, remember to work in a row or two of your base color to pull it all together. 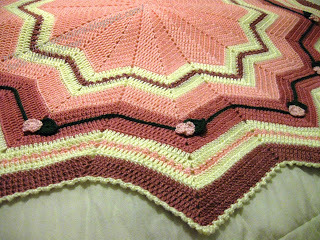 Any stitch I have used on the side to side ripple pattern I have used on the round ripple. Using the basic pattern, change colors and / or stitch patterns on the rounds to suite your taste. The amount of rounds you can complete with each ball will vary in accordance with the amount of yarn; your stitch pattern, your tension and which round you are working on as the rounds expand. Note: When using those little balls remember what may not be long enough for a double crochet row may still be enough to complete a single crochet row which can be inserted from time to time for effect.